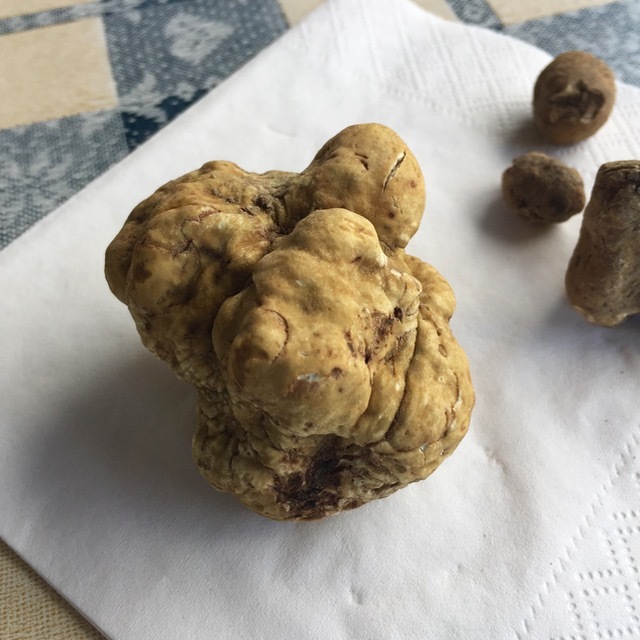 Our guide had found this rather substantial white truffle earlier in the day, but note that the dogs had scratched the surface of the truffle, so it was “damaged” goods so to speak. At roughly 60 grams in weight, it would be worth approximately Euro180 or $200 but could serve some 7-10 people. 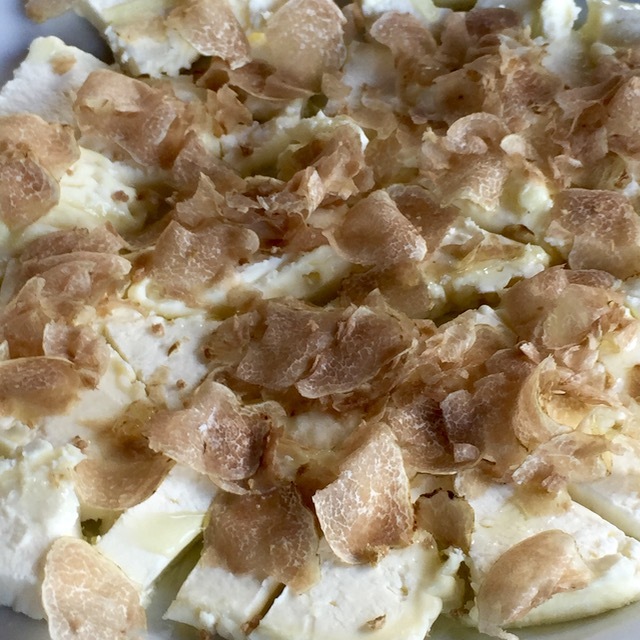 …and shave a VERY GENEROUS amount of white truffles on the cheese!!! 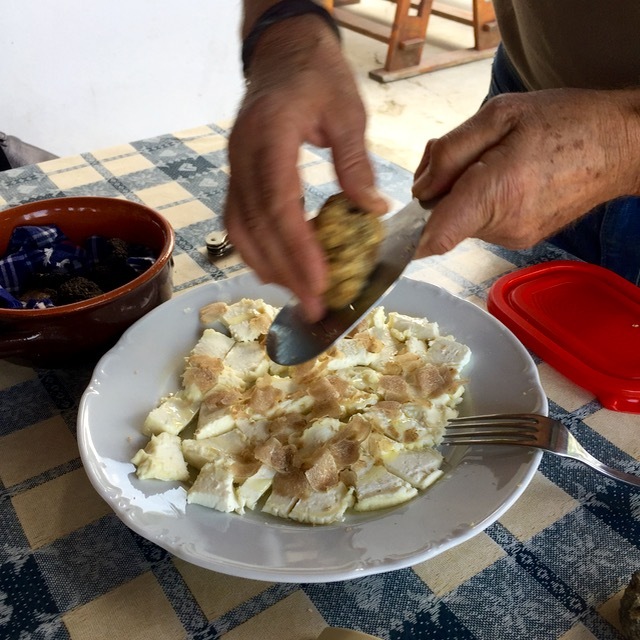 We were quite taken aback by this snack for peckish guests while sitting outdoors enjoying the view of the Alban countryside. 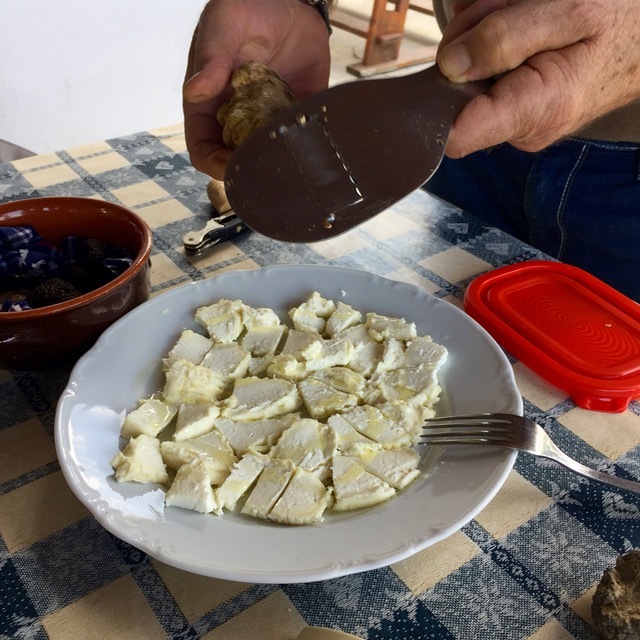 The combined aroma of the freshly found white truffle combined with the tasty three-animal milk cheese was definitely a once in a lifetime taste experience, for sure. 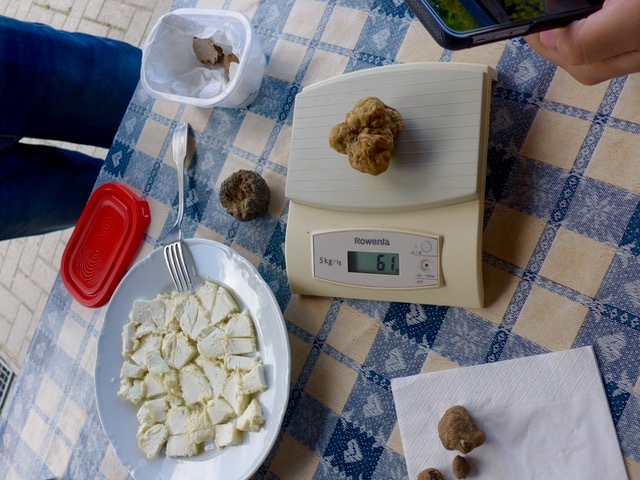 Natale also took out a sampling of recently found black truffles that had been brushed clean of dirt, cross sections that showed the density and patterns within. 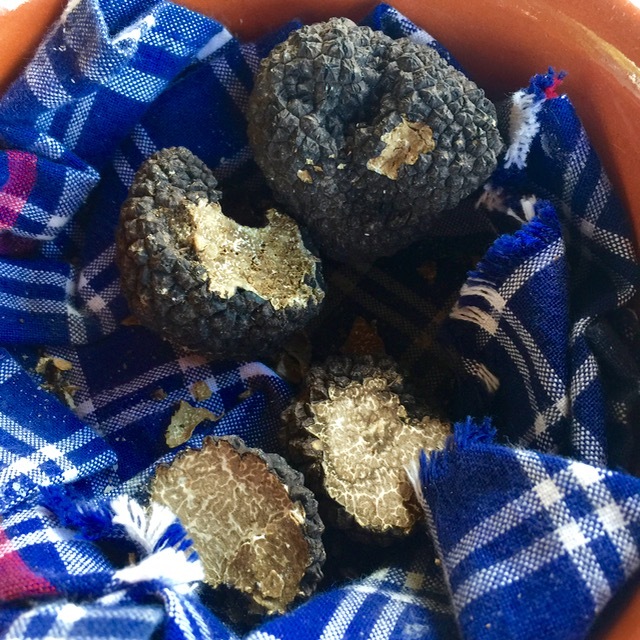 These were fragrant, but again, a different level of aroma and intensity than the white truffles. Now this, is REAL truffle oil. 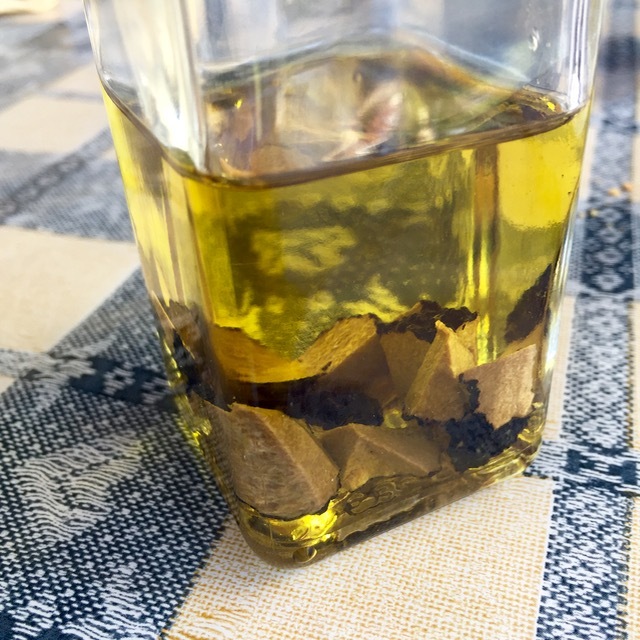 Most food experts would worry about chopping up a moldy bit that has come out of the soil and may contain several kinds of bacteria that would happily breed into a deadly cocktail in a bottle of oil, but at least this is the real thing. Almost all commercially sold truffle oil is made with synthetic flavoring, so you aren’t getting any real truffles at all. Great timely posts, as usual. A tad prodigal but certain to put one in good humour (if not financially put-upon), one of Bernard Pacaud’s signature dishes, the Feuilleté de truffe fraîche ‘bel humeur.’ A thick section of a whole black truffle (about 100 grams) sandwiched with foie-gras, enclosed in a rich puff pastry, served with sauce Bordelaise thickened with yet more black truffle. 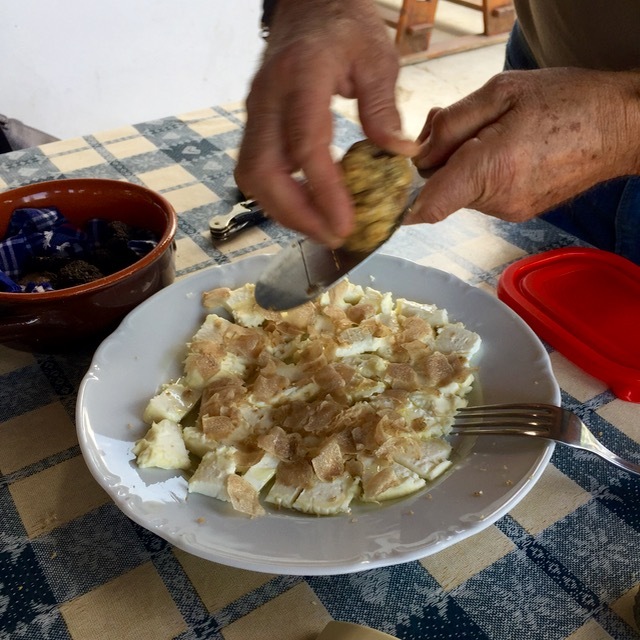 Check out the other pix too in the photo stream for other equally unparsimonious application of black truffle. 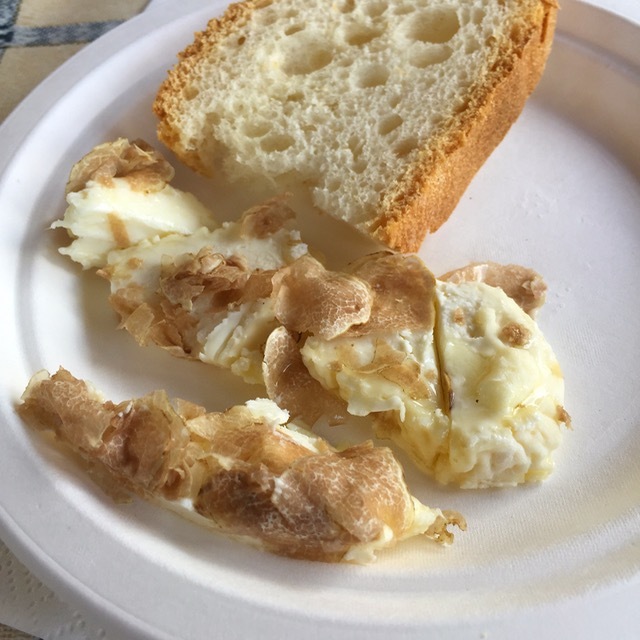 @Joey JJ: you asked in the previous article about foie and truffle? Well, here it is (Footloose’s comment)! Hahahaha, how timely. 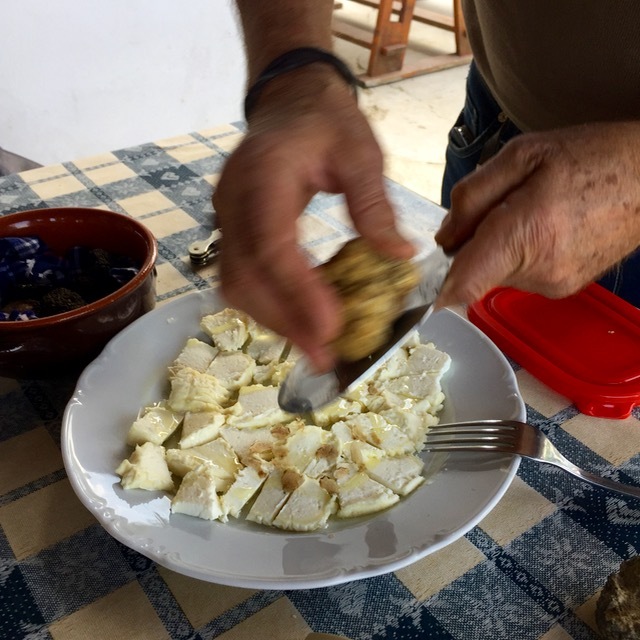 Virgin olive oil is impressively bactericidal: https://www.ncbi.nlm.nih.gov/pubmed/17263460 . But I think a prior scrubbing of the truffles with salt (to remove dirt particles) followed by their burial in it for a day should produce peace of mind besides scented salt. 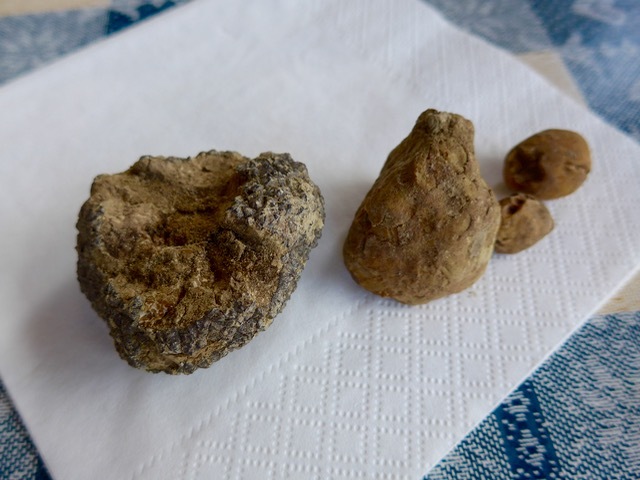 There you go – – I am happy for you being able to fulfill your dreams of hunting for truffles! Awesome experience I bet. A Whole Lamb From Sinan’s Butchery! King Louis Flowers & Plants, Inc.